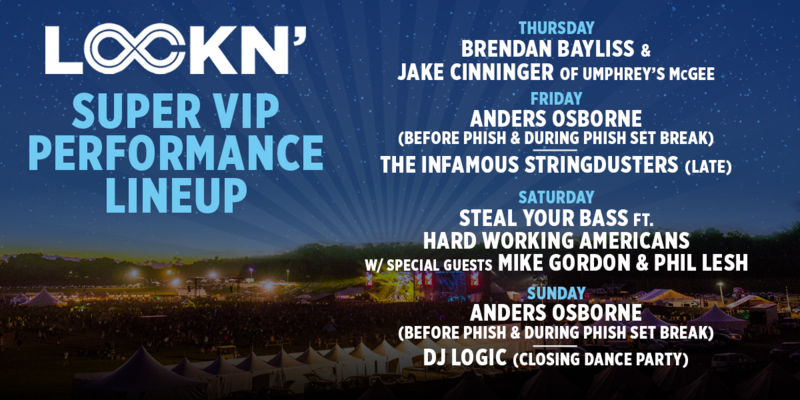 LOCKN’ Super VIP Performances Announced! LOCKN’ Super VIP sets are full of rare collaborations and inspired partnerships, and this year we’re excited to announce an all-star 2016 Super VIP lineup. Thursday night, Umphrey’s McGee compadres Brendan Bayliss and Jake Cinninger will display their tight, soaring live jams up-close-and-personal. On Friday and Sunday, before Phish and during the Phish set break, Super VIPs can enjoy Anders Osborne’s smokin’ blues, with The Infamous Stringdusters taking an organic and intimate approach to a late-night throwdown Friday night. On Saturday night, when the moon is high in the sky, we’re going full-on bass with Hard Working Americans ft. special guests Mike Gordon & Phil Lesh. And Sunday night, after Anders does his thing, we’ll close it out with a dance party courtesy of DJ Logic. Join the fun! To learn more about VIP and Super VIP packages at LOCKN’, visit CID’s website. Have a ticket already, but want to upgrade to VIP or Super VIP? Shoot us an email at locknupgrades@cidentertainment.com and you’ll be on your way.